Options aren't the same as stocks, although there is a link between the equity markets and the options markets. We won't go into the details of these financial instruments in this lesson (we highly recommend our Options Basics Tutorial for more information), but do understand that a stock options are investment vehicles that simply provides the owner the opportunity, but not an obligation, to buy/sell a set number of shares of stock at a set price until a specified date. There are two types of options, calls and puts. An option to buy an asset is a call and an option to sell an asset is a put. One use of options can be to provide insurance against losses. More specifically, put options are a useful tool to add safety to your portfolio. In our example portfolio, we made the following purchase in high-flying Oil play Exxon Mobile. At $81.99 with a very high P/E ratio of about 46, at the time of writing, XOM is not a cheap stock. If anything should cause Exxon to lose profits, or even grow their profits at a slower rate than expected, this stock could be in for a sharp decline. As responsible investors, we would certainly want to protect ourselves from any significant downside risk, and an XOM put option is a handy tool to do just that. In our Simulator account, we can access XOM's option's chain by clicking on the "trade options" (located by clicking on trading tab; it will appear in subheading space right below the tabs), type in XOM and hitting Get Quotes at Investopedia's quote box. If you click on the Aug - 2017 link at the top of the Calls table (or another month of your choosing), you can view all the existing XOM options that have an expiry date of the third Friday of that month. Any option that is in yellow denotes that the option is currently "in the money". We want to protect ourselves from a drastic price drop in XOM shares by selling our Exxon shares for a price reasonably close to what we paid for them. The type of option that we need to look for would be put option. 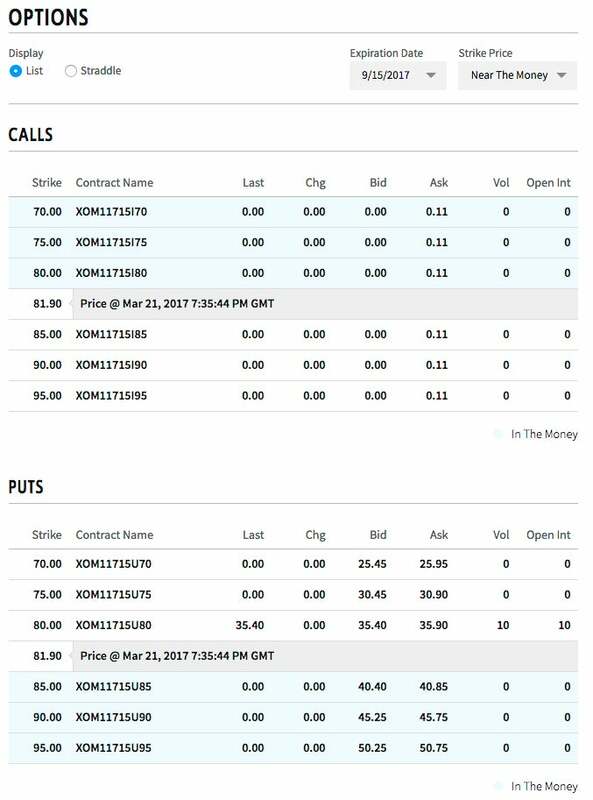 Let's go to the Puts table, shown below the Call Options, and select the put option with a strike price of $75.00. 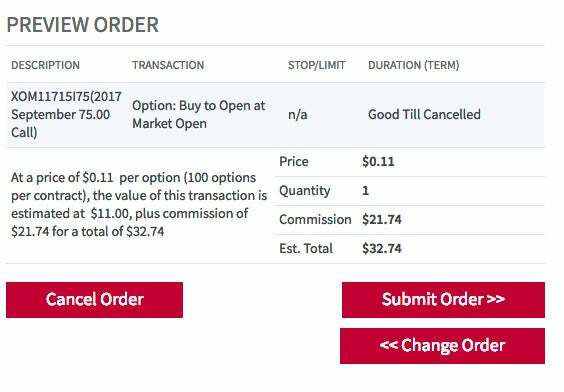 We see that the Ask price, in this example, is $30.90, meaning we'll need to pay $30.90 for a contract of put options (each contract contains 100 options). Click on the hyperlinked text (XOM11715U75) beside the options price of $80.50 to proceed to the trading screen. If everything looks good in the Preview Order screen, we would hit Submit Trade to confirm the order for the Exxon put option. In about 20 minutes, the trade will be processed, and the option would appear in the Option Portfolio section of our example Portfolio Summary. Now, as the coming month goes by, we enjoy the benefit of using the option as a safety net. In the real markets, no matter what happens to Exxon's stock price in the coming month, your shares for anything less than $75 per share. Note that for simplicity purposes in the simulator, options cannot be exercised (eg. you cannot exercise a put option to sell stocks that you currently own). What happens is that you get the equivalent amount of cash by selling the options that would cover any loses when you sell the underlying stock position. The process to sell an option follows the sequence of events as selling a stock (click the corresponding sell link on the portfolio summary page etc…). Feel free to dig around the option quotes for some of your stock holdings and purchase a call option contract on a few of your stocks, following the same steps we have outlined above in our Exxon example.